Bartsch, VI, 1818, 432-433, 140, as Anonymous, School of Fontainebleau, and seems to be by Fantuzzi. Herbet, II, 1896, 272 (1969, 68), 13, as Fantuzzi, and V, 1902, 80-81 (1969, 232-233), as related to the stuccoes of the Pavilion of Pomona, according to Dimier. Zerner, 1969, A.F.39 (Vienna), as 1542-1543. COLLECTIONS: Amsterdam (De Jong and de Groot, 1988, 268, 599, Fig.). London, 1850-5-27-141. Paris, Eb 14d; Eb 101 Fol. ; Ed 8b Rés. Vol. II, no. 49. Vienna, Vol. XIII, 2, p.66, no. 424. Dimier, 1900, 313, as Fantuzzi, after Rosso’s frame in the Pavilion of Pomona. Barocchi, 1950, 251, Fig. 230 (Paris, Eb 14d), as Fantuzzi and as an unfaithful record of Rosso’s frame. Zerner, in EdF, 1972, 266, Fig. (Paris, Eb 14d), 267, no. 316. Zerner, in Fontainebleau, 1973, I, 103, Fig. 77, II, 84, no. 316. Zerner, IB, 33, 1979, 415 (London). Borea, 1980, 258, no. 651, 260, Fig. (Vienna). Adelson, 1980, 160, Fig. 50. Lévêque, 1984, 238, Fig. (Paris, Eb 14d). K. Wilson-Chevalier, in Fontainebleau, 1985, 136, 138, no. 82 (Paris, Eb 101 Fol. 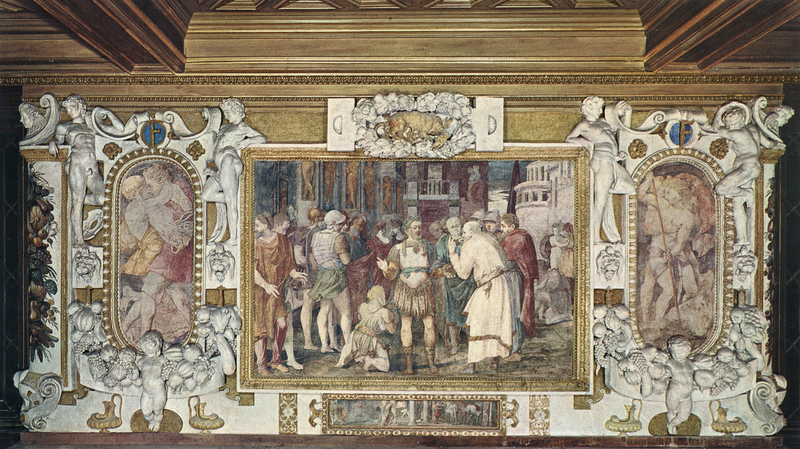 ), as reproducing the frame of Rosso’s fresco in the Pavilion of Pomona, but not Primaticcio’s. Carroll, 1987, 204-207, no. 66, with Fig. 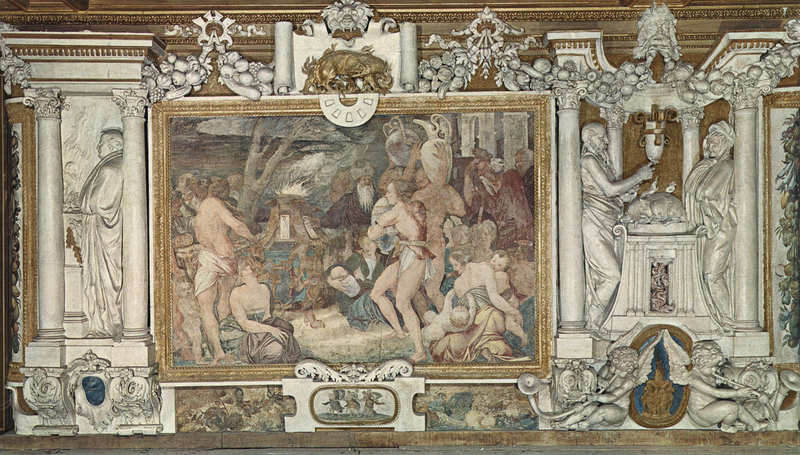 (Paris, Eb 14d), as after a lost drawing by Rosso of 1532 to mid-1533 for the frames planned but not executed in the lost Pavilion of Pomona. Brugerolles and Guillet, 1994, 40, under no. 15, and 68, under no. 24. 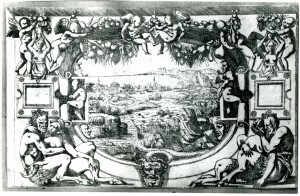 This etching, excluding the center scene, reproduces a lost drawing by Rosso that was made for the stucco frame that was planned, but probably not used, for his Vertumnus and Pomona fresco in the destroyed Pavilion of Pomona at Fontainebleau, and most likely for Primaticcio’s fresco that also decorated this pavilion (see L.39). 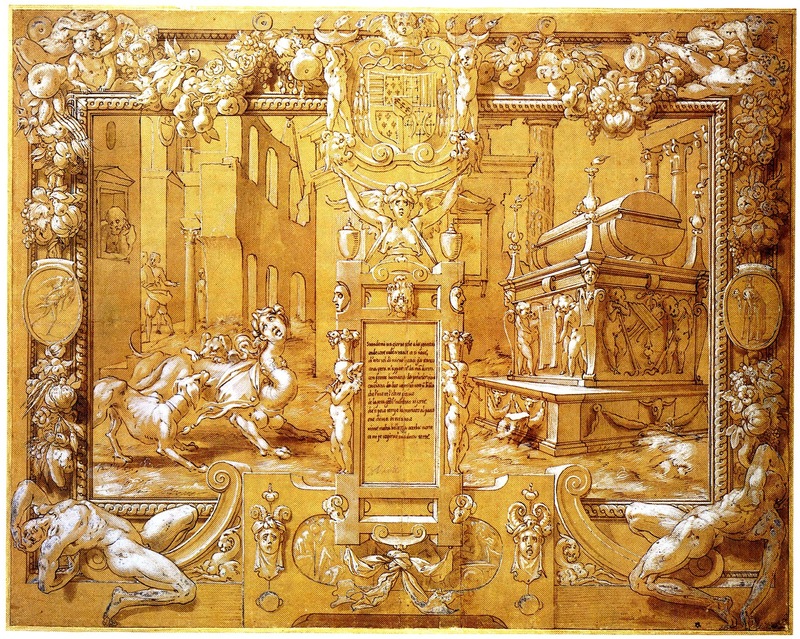 The size of the figures of this frame is similar to that of the stuccoes that frame the Scene of Sacrifice in the Gallery of Francis I (Fig.P.22, VII N a), and a certain resemblance in the size and kinds of motifs it shows can also be found in the stuccoes that flank the Unity of the State in the gallery (Fig.P.22, VI S a). These stuccoes would seem to have been designed before April 1534 when the stuccoers began their work on that project. The women at the sides of the etching that have bands around their necks – only the right one actually passes around the figure’s neck – from which framed plaques hang are very much like the central winged decorative figure in Rosso’s Petrarch drawing at Christ Church, done, it would seem, around 1534 (Fig.D.47a). Rosso’s lost drawing from which Fantuzzi worked was made in 1532 or 1533, when it is most likely that the Pavilion of Pomona was decorated. As in the case of all of Fantuzzi’s etchings made from drawings by Rosso that survive, this etching is most probably in reverse of Rosso’s lost design. 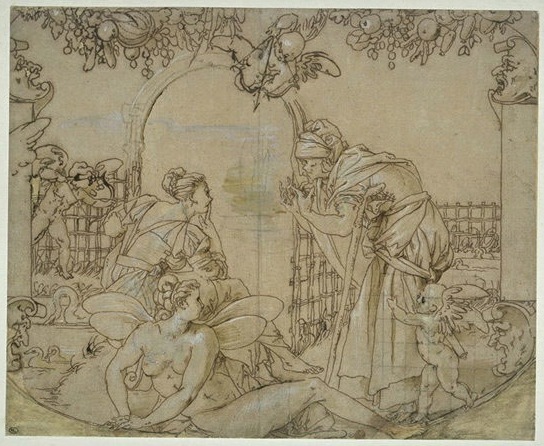 That lost drawing was most likely of the frame without the scene of Vertumnus and Pomona, for which Rosso made other drawings which included only a few framing details. With reference to a copy of one of these drawings, in the Louvre (Fig.D.46Aa), it should be noted that the putto at the right of the oval has one wing visible that overlaps the central area. COPIES, PRINTS: E.56,7. Du Cerceau, etching. Herbet, IV, 1900, 302 (1969, 152), V, (Grands Cartouches, Second Set), 9. 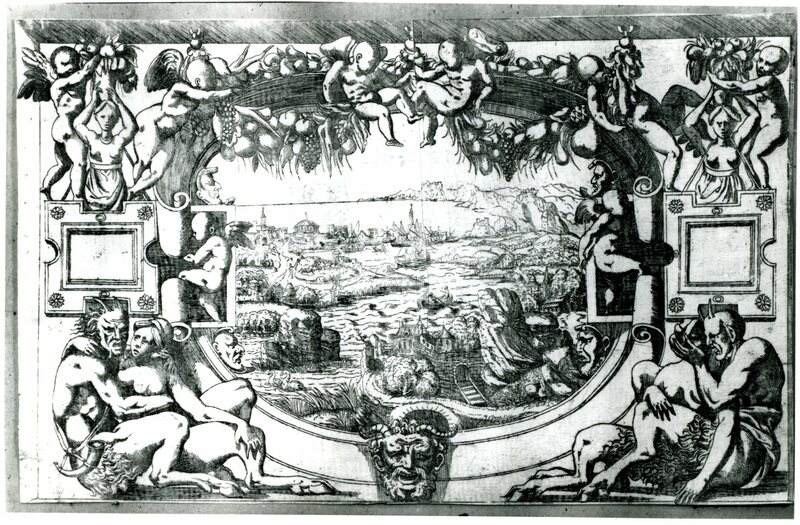 Sketchily copied in reverse, without the landscape, from Fantuzzi’s etching, and with variations along with the addition of two small scenes in the small square areas at the sides. E.57,10. Du Cerceau, etching. Herbet, IV, 1900, 306 (1969, 156), VI (Petits Cartouches), 24. In the same direction as Fantuzzi’s print but without the landscape in the center.